A Systematic Investment Plan (SIP) is the best investment option for many investors – especially if you’re a young person, just beginning your investment journey. A SIP is a low-risk move, ideal for those who are in it for the long haul because else, the returns tend to be low. A steady investment of even Rs.500 per month has the potential to generate decent returns in the long run without putting a major dent in your pocket. But like all other investment options, it’s never wise to put in your money unless you’re well informed. Here are some things you must keep in mind when investing in Mutual Funds via SIPs. – What exactly is a SIP? A SIP lets you invest small amounts regularly in equities, debts and other kinds of mutual funds. It involves you buying units of any (or many) Mutual Funds of your choosing by investing a minimum of Rs. 500 per month. It is then up to you to redeem your units at any point in time. A SIP is ideal for younger investors since it practically guarantees good returns with a lower risk of capital loss. It bridges the gap between high-risk options like equities and low-risk options which may not produce returns. Don’t just start investing because it’s the “in” thing and everyone around you is doing it. If you really want to gain from your investment, align it with your goals. Whether that goal is to buy your dream car after 10 years or to generate enough capital to start your own business in 15 years, or even go to the vacation you always wanted – your end goal and the money it’ll require should be fixed in your mind as early as possible. Once that’s settled, you can go about looking at what exactly to invest in and how much to put into it every month. For example, if your goal is to buy a car costing ?30 lakhs in 15 years, you can’t invest in something that’ll give you any less than that at the given time. Interview with Gaurav Jain, Director at Hem Securities. While the market may have fallen around 10 percent from its peak, experts such as Gaurav Jain, Director, Hem Securities believe that the worst may be over now. “In the next quarter, the market should settle and then a pullback is likely,” Jain told Moneycontrol’s Uttaresh Venkateshwaran & Sunil Shankar Matkar. He expects largecaps to move ahead and midcaps will play catch-up. The market has been trading off the previous high points. What is the outlook for D-Street going ahead? Over the last quarter, we saw events such as the Union Budget, which introduced taxes on long term capital gains (LTCG). Global markets reacted negatively, while big IPOs also sucked liquidity from the market, among other factors. As such, the market had a good run up in the past two three quarters. In the next quarter, the market should settle and then there could be a pullback. Next quarter should be of accumulation and positive movement. So, what kind of returns are you expecting from this market? We are in an election year. So, the market could behave differently with results coming on. Overall, for FY18 we are looking at 8-10 percent returns. What can be seen as triggers for this market? Firstly, many companies’ results were affected in one quarter on the back of Goods and Services Tax (GST). With new GST Bill coming in full flow, it should give positive flow for most sectors. Even as the e-way bill is introduced, some companies could face some issues at the start and then gradually get comfortable with it. Secondly, look at growth visibility in the Sensex and Nifty. Several managements are hinting at positive cues. Earnings could improve and several companies have done their expansions on their side. Lastly, we have to wait for how monsoon pans out. So, overall there is positive momentum and investors are quite bullish on India even at this point. Does that mean we could go back to the record high levels? What are you hearing on private capex plans? Are they willing to spend on that front as well? Most companies, the big ones especially, have done their share of capital expenditure. One important reason why this is happening is due to change in technology that is erupting. For instance, look at telecom sector. In case Reliance Jio comes up with a new technology, rivals also tend to counter those. In case of textiles, many things have happened and firms are adding up more technology and machines. With changing technology, fast-growing companies need to adapt to it and they are deploying resources in those areas. Could you throw some light on the state of midcaps? How do you expect them to perform going forward? Largecaps should start moving first, going forward, followed by midcaps. Investors currently are playing conservative as they saw their stocks bleeding all through the last quarter. Hence, the money is going into largecaps right now. But what about valuations for several segments in the market…how did the IPO market perform in FY18? Look at the number of IPOs that came up with multiples of 30 and 40 times. Fund managers that we spoke to are talking about large systematic investment plans (SIPs) that have to be deployed into such stocks and that is probably why such high multiples were seen. In FY17, we saw around 37 IPOs hitting the market and this figure could be higher this fiscal, looking at the prospectuses filed and information available from merchant bankers. Also, IPO sizes are a lot larger now. But will investors have the appetite going forward? Institutional investors will have it. They will always look at beaten down stocks and they also do not have issues with funds. Currently, retail investors are investing less. If they have Rs 100 with them, they are looking to invest Rs 20 right now. In fact, many retail investors have booked profits in the past quarter. Is there much downside from the current market levels? I don’t think so. The worst should already be over. In the past few days, a few stocks have risen, which have pushed the market. We should start seeing a pick-up in many more stocks. Essentially, people are not in a panic stage, while retail investors have looked to book profits and are not in a hurry to invest. So, what will your advice be to a 35-40-year old investor? They must invest in mutual funds. But you could also do it making money by directly investing in equity markets as well. What sectors are you looking at currently? We expect pharmaceuticals to perform, while it could be a challenge in case of information technology names. You can look at infrastructure sector as well. These companies are flooded with orders. On banks, it is clearly not the case that all PSU banks are bad. Right now, people are not trusting PSU banks and private banks are usually considered more transparent. It is a play on perception and that could be seen in cases of a recent listing such as Bandhan Bank. The IPO came at a very good multiple and still listed at good returns. These are companies with professional management which are growing along with having fast execution and chasing for business. As such, we were seeing a shift to private sector banks, but currently investors also do not know about hidden concerns in PSU banks too. LTCG tax on equities has become a reality now. Are you getting queries about it and what are you telling them? I think the sentiment around it has been already digested in the market. People are taking in the transition in stock market. I feel that this is not an issue at this point. How much of a risk is political scenario for the market? The market tends to be very volatile on political instability. As soon as there are chances of dent to existing government, it starts reacting. The question is not about which government, but about a stable one. This is important from a foreign investor perspective. These would have regular impact but not larger level…the market will make a comeback once the elections are over. As we move into end of this year (and closer to general elections), investors may hold for couple of months to understand what is happening (on the political front). On the global front, any statement from the US with respect to protection of its own trade boundaries is a major risk for the market. 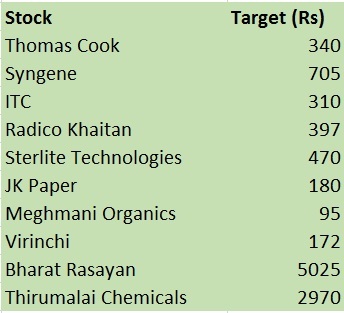 Lastly, what are your top stock picks for FY19? Equity Linked Savings Scheme or ELSS funds are a type of mutual funds whichbase their returns from the equity market. These funds are tax saving in nature and are eligible for a tax deduction of up to Rs1.50 lakhunder Section 80C of the Income Tax Act. Below are a few things that an investor must know before investing in ELSS funds. ELSS schemes are a category of mutual funds promoted by the government in order to encourage long term equity investments. Under this scheme, most of the fund corpus is invested in equities or equity-related products. There are two categories in ELSS mutual funds i.e. dividend and growth. The dividend fund is further divided into Dividend Payout and Dividend Reinvestment. If an investor opts fordividend payout option, he receives the dividend which is also tax-free,however,underthe dividend reinvestment option, the dividend is reinvested as a fresh investment to purchase more shares. Under the growth option, an investor can look for longterm wealth creation. It works like a cumulative option whose full value is realized on redemption of the fund. How to invest in ELSS? One can invest in ELSS via two methods i.e. lumpsum or SIP. SIP or Systematic Investment Plan, is a process where an investor needs to invest a fixed amount of money every month at a specified date. SIP inculcates a disciplined approach towards investing in an investor. SIP also gives the benefit of rupee cost averaging to an investor. What is the lock-in period in ELSS? ELSS funds have a lock-in period of three years. Whencompared to EPF, PPF, NSC and other prevalentinvestments under Section 80C, ELSS has the shortest lock-in period. What is the benefit of tax in ELSS? The primary purpose of any investment is to gain deductions under income tax for wealth creation. ELSS funds fit that bill perfectly. An investor gets a doubleedged benefit of tax saving and wealth creation at the same time. Dividends earned from ELSS funds are also exempted from tax. ELSS funds also provide the benefit of long term capital gains as they have a lock-in period of three years. What is the investment limit of ELSS funds? One can start investing in ELSS mutual funds with a minimum amount of Rs500, and there is no upper limit on how much a person can invest in ELSS funds. However, the tax saving ceiling is only up to a maximum of Rs1,50,000 a year. What are the risks involved in ELSS funds? ELSS mutual funds do not have ironclad guarantee over returns, as theygenerate their earnings from investments in the equity market. Nevertheless, some of the best­ performing ELSS mutual funds have given consistent and inflationbeating returns in the longrun. This quality is not possessed by the other fixed income tax­ saving investments like PPF andFD. ELSS mutual fund investment has now become a popular tax saving investment under Section 80C, and it is also ideal for retirement planning and wealth creation coupled with the benefits of lower lock-in period, SIP method of investment, rupee cost averaging risk and no tax on dividends or the benefit of capital gains. ELSS funds should be taken into account by every investor while planning their investment goals. Everyone wants to be financially secure and well off by the age of 35-40. However, when we are in our 20’s, we tend to live life in the moment and forget saving for the future. Considering that you are working and earning, it is important for you to assess your tax liability and take advantage of tax deductions available under Section 80C of the Income Tax Act. “By proper tax planning, you can not only reduce your tax liability but also save some more to invest towards your other goals. One of the best tax-saving instruments is Equity-Linked Savings Schemes (ELSS). It is a type of open-ended equity mutual fund wherein an investor can avail a deduction u/s 80C up to Rs 1.50 lakh for a financial year,” says Amar Pandit, CFA and Founder & Chief Happiness Officer at HapynessFactory.in. There are various events like accidents, illnesses and other unforeseen events that we may encounter in our lives. These events should never occur, but if they do, one needs to be adequately prepared for the same. In critical cases, such events may hamper one’s ability to work and may even lead to a loss in earnings for a few months or years. Hence, “it is advisable to build a contingency corpus, which is equivalent to at least 5-6 months of living expenses. Further, your emergency fund should be safe and easily accessible (liquid in nature) at short notice, in case of an emergency. Hence, savings bank accounts and liquid mutual funds are two options for setting aside the emergency corpus. However, considering that liquid and ultra-short term mutual funds are more tax efficient in nature, it is advisable to park a major portion of your corpus in the same,” says Pandit. It is very important to save and invest towards your long-term goals such as marriage, buying a house, starting your own venture, retirement, and so on. You must start with determining how much each goal will need and the savings required to achieve the goal. Once the corpus is fixed, you can invest towards the goal regularly. As an investment strategy, start fixed monthly investments – SIPs (Systematic Investment Plan) in mutual funds. Always remember, the earlier you start investing towards your goals, the longer time your investments will have to grow and the more you will benefit from the power of compounding. Equity mutual funds which are growth oriented are a preferable investment option for long-term goals. There are many short-term goals that are recurring in nature, such annual vacation, buying a car or any asset in the near term and so on. For such goals, you are advised to park your funds in liquid or arbitrage mutual funds rather than a savings account. “Mutual funds are more tax efficient than savings accounts and also there are different funds for different time horizons. For example, for goals to be achieved within a year, you can opt for liquid or ultra-short term funds whereas for goals to be achieved post one year, you can opt for arbitrage funds,” advises Pandit. Life and health insurance typically are not supposed to be considered as investments. However, both are very important and must be considered as one of the priority money move to be made before turning 30. If you are earning and have a family dependent on you, you must assess and buy the right life insurance term cover for yourself. Further, with costs of health care and medical on the rise, any untoward illness without sufficient cover will have you dip into capital which is unnecessary. Hence, there cannot be any compromise on health insurance. Thankfully, there are various health covers available in the market today. You should opt for the right cover for yourself, depending on your needs and post considering all the options. Systematic investment plans (SIPs) were first introduced in India about 20 years ago by Franklin Templeton, a global investment firm. SIPs entail recurring disciplined investing via experienced portfolio managers. By necessitating fixed periodic (monthly, quarterly etc.) investments, it makes the timing of the markets, which can be risky, irrelevant, and at the same time, it typically provides above average market returns over a long period. Therefore, SIPs can be relatively less risky and also offer a hedge against inflation risk. The top SIP funds have consistently given annualised returns of about 20% over the last two decades. The return from SIPs are calculated by a methodology called XIRR, which is a variant of internal rate of return (IRR). In the recent times, SIP fund managers usually tend to invest not more than 2% of the total capital available in a single stock. Portfolios are usually well diversified. Currently, there are scores and scores of SIP funds to choose from. Different types of SIPs are available to suit an individual’s risk appetite, ROI goals, the time period of investment, and liquidity. Unlike PPF or Ulip, there are no restrictions and penalties on regular SIP payments and withdrawals. Investment can be as low as Rs 500 per month. Retail investors can look to invest in small-cap SIP funds initially, and once their capital builds up significantly, can shift to the less risky large-cap SIPs. Equity investing have always been associated with high riskiness and the proverbial doom and crash in India. However, the trend is changing in recent times. Increased availability of information about investing, and greater digital marketing, has led to more and more individuals taking the SIP route. The number of SIP accounts has gone up by about 30% in the last 12-15 months alone. SIP monthly inflow volume now stands at about 3,000-3,500 crore, as opposed to about 1,000-1,500 crore in 2013. Retail participation is low India but is bound to increase at an accelerated rate. Several brokerages are now waking up to the fact that higher P/E ratios are the new normal, as they are warranted by a fundamentally strong economy. Currently, the Indian stock market capitalisation to GDP ratio is approximately 98%, compared to 149% in 2007. With only about 250 Futures and Options (F&O) available out of approximately 4,200 individual securities, shorting opportunities are limited. Increased inflow SIP money could very well drive and support quality stocks in a growing economy. What should someone looking to enter the stock market either with cash or via SIP do at this time? On a price-to-earnings basis, market is over-valued at current levels. Because of the persistent flows from both foreign and domestic portfolio investors, the market is currently running a year ahead given that earnings per share (EPS) is expected to improve significantly by 2018-19. This is because we believe that over the next twothree years, capacity utilisation can increase and so can the return on equity . Currently , the macros are strong but Indian companies are facing various pockets of challenges. But consumption across the spectrum is likely to hold strong. Given this expected improvement, it is likely that there could be a consistent flow of investment from institutional investors, thereby lending a reasonable investment experience over next twothree years. But since the market is already slightly over-priced, one cannot expect abnormal returns. For those investing via SIP , they can continue with their investments because over the next three years, the investment price will average out, thereby yielding better returns. For someone who is coming in when sensex is at 30,000 level, can consider dynamic asset allocation funds which result in lower equity exposure when the equity level is up and vice versa. Yes, it does. But it is good to opt for conservative returns when sensex is at 30,000 level.Even if the index were to head higher say 33,000 level, the only limitation here would be that the entire upside is not captured. But when market turns volatile at higher levels, this class of funds can limit downside. As we all acknowledge, there is more pain in losing Rs 5 than the joy in gaining Rs 30. If you are investing in equity MFs, one should consider large-caps because mid-caps are over-valued at present. Continue investing but invest with caution because returns may not be too high from current levels. Just because banking funds as a category has delivered 40% plus returns, it does not mean everyone should invest in it based on past one-year return. A few years ago, the government was worried about the huge inflows from FIIs and feared the impact post withdrawal. But now mutual funds seem to have emerged as an effective counter-balance. Has the domestic MF industry matured? To a certain extent domestic institutions have emerged as a strong counterbalance. Over the last few months, mutual funds and foreigners have pumped in money into stock markets, thereby pushing up benchmark indices. However, even if foreign investors were to withdraw tomorrow, Indian MF and insurance industry which is putting in over $3 billion a month, will be able to balance it out, thereby limiting any adverse shocks. Today , people refrain from investing in real estate, gold and bank FDs, which is currently yielding 6-7% return pre-tax. In such an environment, equities are becoming a TINA factor -there is no alternative. So, we believe that steady inflows may continue. How much of small investor money is coming into the market? Mutual fund in India is all about small investors; high net worth individuals form a very miniscule portion. We are opening nearly 120 offices across smaller towns such as Nadiad (Gujarat) and Arrah (Bihar) because we believe that MF is a viable business. We have ensured that we are present pan-India, including North East. If we can give a better alternative to unorganised investment avenues, people can invest. While people in Gujarat who are more evolved investors can move to value investing, in the East, money can be moved into mutual funds from unorganized sector, there by giving us an opportunity to show the importance of well-regulated businesses. Will the recent change in regulations push MFs? We are in an infinite market as the MF penetration is hardly 4% in the country . The one major challenge now is simplified onboarding process for investors. Today, 85% of our business comes from existing consumers and this shows that the market is not expanding adequately . As a fund house, we receive several queries on our website, but the conversion rate is disheartening. We have come to realize that investors are wary of the entire KYC process. Like insurance, AMCs too should be allowed to use the bank KYC details, thereby eliminating the duplication of paperwork. The reason why bank KYC should suffice is because entire industry does not deal in cash transactions. MFs receive funds via bank accounts and at the time of redemption the funds are transferred to the same bank account. So there is absolute transparency . For a millennial, the decision to buy a home can be a life-altering one. For young individuals or couples, getting into a long-term debt commitment such as a home loan can be a daunting task. However, as financial advisors would agree, buying your first home in your 20’s or early 30’s can be one of the smartest moves you can make financially, as it gives you a great head start in more ways than one. Firstly, unlike rent payments, a mortgage payment (though it may seem overwhelming in the first few years), goes a long way in asset building and increases your home equity. Secondly, it restricts you from making unnecessary purchases and keeps from accumulating credit card debt. Thirdly, a secured loan such as a home loan early in life and making timely repayments on the same gives your credit score a boost and paves your way for further access of credit when you require it. Those who have just about completed hefty student loans may develop cold feet at the thought of skimping once again and preparing to take a home loan. At this stage in your lives, it is important to see the bigger picture. In a few years from now, a roof over your head that you can call your own before you reach your middle years will feel like a great achievement. If you have firmed up your mind to purchase your first property, the first thing you must do is begin investing with this specific goal in mind. Set a budget and pick an investment option that will help you meet your goal in a specific number of years. While setting a budget, do not be too hard on yourself and try to stretch limits. Your first home need not be your only home and you can always graduate to a bigger place when you can afford one. While saving for your first home, equities may be your best bet as they offer you the best inflation adjusted returns as compared to other instruments despite the risk factor. If you do not have the expertise or the time to invest in equities yourself, you can choose the systematic investment plan (SIP) route of mutual funds. By investing in equities through the SIP option of mutual funds you also get the advantage of compounding, which means your returns are reinvested over the term you choose to remain invested in the fund, thus helping you achieve your financial goal of saving up enough for the down payment of the property. Do enough research before you decide on a lender. Many lenders want young and dynamic home owners as customers and have specific loan products that make it easier for you to make repayments in your initial years and increase the quantum with the rise in your career. Checkout such options and read in between the lines to understand each nuance carefully. One of the most important factors that will decide whether or not you are creditworthy, is your Credit Information Bureau (India) Limited (CIBIL) score. Your CIBIL score is a three digit numeric between 300-900 that is assigned to you by India’s premier credit bureau. This score is based on your credit behaviour or how you have serviced your credit lines you have availed of thus far. In order to maintain a good CIBIL score (750 and above) it is necessary for you to have serviced debt regularly and well before applying for a fresh loan. One of the best ways to ensure that your CIBIL score remains intact is by making a habit of not building up credit card debt. Spending very small amount and ensuring that you make a habit of properly repaying your credit card bills before the end of each and every billing cycle is a good way to ensure that you do not get into a debt trap and also maintain a fairly good CIBIL score. In this world dominated by the internet, the search for your first home must necessarily begin online. There are a host of websites such as 99acres.com, magicbricks.com, indiaproperty.com, makaan.com that have made it easy to filter searches according to your requirements, budget and location preferences. It is a good idea to go through all of these portals and shortlist properties that you would like to see personally. Besides using such websites, make the best use of the internet and social media to reach out to actual buyers and check the reputation of the builder, the living experiences and the problem areas if any. A thorough virtual search gives you a firm footing before you start visiting the properties personally and finally zero in on a choice that is best suited to your needs and budget. The real estate market can turn out to be a head spinner when you are out there on a house hunt. It is important to be mindful of what your requirements are and be aware of your rights when seeking out a home. Once you have taken possession of your new house, the first thing to do is store all your property documents. Make a few photocopies and keep them in at least three different locations. It is a good idea to get all your property documents digitized and locked in an e-safe. Next, update all your official documents with your new address and finally transfer all property related paperwork such as water and electricity meters, society membership and property tax records in the local municipal body in your name. Once you have taken possession, the first thing to do is store all your property documents safely.